you know that there’s more to life but you’re just not sure what it is? you already work as a coach or a therapist and feel burned out and weary and you’d like to make the change to become a Three Principles Practitioner? or you want to become a coach and want to be a pioneer in this field of psychology and spirituality? you want to experience more clarity and joy in every area of your life personally? you want to have more impact in your working life, whether you work for yourself, you're a leader or part of a team? or maybe you’ve already worked with me and had a huge shift in your understanding, and your life, and you’d like to deepen your understanding or help others to experience this transformation? What is different about this training? This is one to one mentorship that will blow apart all of your old beliefs and illusions to help you to become the best you that you can be in life and in business. You won't get lost in a crowd. This mentorship is about you. And only you. This is not a three or four day intensive, this is a year long programme that will change your life. 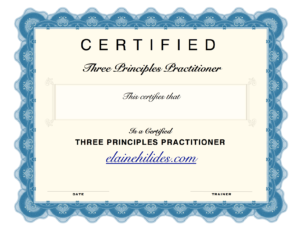 It's time to become a Three Principles Practitioner! Watch Paul talk about his lifetime of anxiety and depression and how his life changed after I introduced him to the Principles. Paul was a top salesman at the time and wasn't looking any further than feeling better and having a happier life. But, he was so impacted by his understanding that he wanted to share what he saw with others and is now a Three Principles Practitioner. Paul spoke to a group of around 700 people at a conference in 2015 and is speaking to another large audience about his understanding in LA October 2016. The first four days are designed to deepen your understanding of the Three Principles so that you can embody the concepts. This is the foundation piece on which the rest of the training can be built and will help you to see that life only works one way and there are no exceptions. I call this the, ‘no-wobble’ factor. This is where you'll go through your own personal transformation. These four days will concentrate on the impact the training is having on you personally and professionally and will deepen your confidence that you are impacting people around you in the most wonderful way. Whether you work as a coach and want to transform your practice or you just want to have the best life you can have, this last part of the training will help you to see the results you're already getting and the new possibilities that you had no idea existed. Our 12 Zoom sessions can focus on any questions that may come up for you or what is going on for you personally or professionally and can also deal with practicalities like insurance, advertising or websites if you want to take this understanding out in to the world. Because this understanding is universal and because every issue that is ever felt is underpinned by thought, there is literally no area where sharing these principles couldn’t have an impact. There’s a change in the air in the world, this new paradigm is having a massive impact. Join the ever growing band of Three Principles Practitioners and become a pioneer in this field. Please email me to apply for this training and start your incredible journey. The cost of this training is £5,000 paid in full. A small price for a huge transformation.